President Kennedy is presented with a model of the Mariner 2. 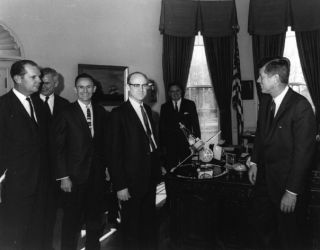 In this historical photo from the U.S. space agency, Dr. William H. Pickering, (center) JPL Director, presents the Mariner 2 spacecraft model to President John F. Kennedy, (right). NASA Administrator James Webb is standing directly behind the Mariner model. The Mariner 2 probe flew by Venus in 1962 after the failure of Mariner 1, sending back data on its atmosphere, mass, and weather patterns. It stopped transmitting in 1963 after delivering a wealth of scientific information.